1According to the GIEC report (2007), mountain ecosystems are considered extremely vulnerable to climate change. Climate change scenarios predict not only a continuation of the warming trend already observed in the Alps, but also an increase in climate extremes, particularly droughts. Indeed, the succession of droughts observed during the first decade of this century show that climate change is already tangible (Lelièvre et al., 2009). Figure 1 illustrates this phenomenon in the Embrun region of the Hautes-Alpes department, where the years 2003 to 2007 were marked by a water deficit significantly greater than the average for the period 1958-2008. The consequences of climate change on the production of grasslands is beginning to be evaluated (Seguin and Soussana, 2006): summer droughts and more marked heat waves, but also lasting changes in the botanical composition of grasslands and alpine pastures, and modifications in disease and pest cycles. Other effects have also been identified for alpine farms: difficulties in planting crops or temporary grasslands in the spring, repercussions for alpine pastures with time shifts in the phenology of plants, and sometimes a reduction in animal weight gain or a decrease in milk production. Because mountain livestock systems operate in a difficult environment (climate, relief), which restricts the level of intensification possible, and because they are often largely based on the consumption of grass, they appear particularly exposed to risks arising from climate change (Lemaire et Pflimlin, 2007). Figure 1. Water deficit (potential evapotranspiration - precipitations) between April and September, from 1958 to 2008, at Embrun meteorological station (Hautes-Alpes). 2To understand how herbivorous livestock farms function, a research movement studied the practices of livestock farmers with a view to describing the interactions between “man, herds and resources” (Landais et Balent, 1993). The concept of the “livestock farming system” proposed is intended to identify the interactions between the human and biotechnical dimensions of livestock activities (Dedieu et al., 2008). 3There are numerous studies of the way in which livestock farmers take climatic risks into account in their decisions. In this article, starting from the hypothesis that livestock systems are likely to adapt differently depending on their functioning, our aim is to characterize the attitudes of farmers in response to drought risks and to assess the changing sensitivity of their livestock farming systems based on an identification of the measures they have put in place, or that they envisage for the future. 4The study is based on two samples of livestock farms, one in the French Southern Alps and the other in the Northern Alps. 5In the Southern Alps, surveys were conducted on the functioning of 29 livestock farms using alpine pastures, in the Ecrins National Park (20) and the Vercors Regional Natural Park (9). These farms were classified in different livestock systems, depending on the relative importance of fodder stocks and grazing areas in feeding the herds, and on the importance of irrigation. Based on the typologies proposed by the Institut de l’élevage (Livestock Institute) in its networks of reference farms, we were thus able to distinguish the following sheep systems: i) “Mediterranean transhumant systems” with irrigation in the lowland (4 farms), (ii) “Prealpine pastoral (grazing) with transhumance but no irrigation” (3 farms for which hay stocks harvested on the grasslands represent less than 20% of herd’s feeding needs (iii) “mountain pastoral” (5 farms where stocks harvested represent between 20 and 40% of feed days for the herd), (iv) “high mountain” (10 farms, sheep and mixed cattle and sheep, where stocks represent more than 40% of basic diet for herds). Systems specialised in cattle livestock were also distinguished: they correspond to three farms located in the Embrun region, with dairy or suckling cattle and with irrigation, and four high mountain farms (three raising heifers and one dairy farm, which produces milk on the alpine pastures and cattle are wintered on an other farm). 6In the Northern Alps, we used the results of a study conducted by a research group (Groupement d’intérêt scientifique Alpes-Jura) participating in the ClimAdapt1 project (2008-2010) which is based on a survey of farms (27 in the Alps) illustrative of certain farm types (Réseaux d’élevage Rhône-Alpes, 2005), and identifies, in an aggregate manner, the measures already in place or envisaged by farming system type. Here we are concerned with grassland-specialised dairy cattle systems: (I) with wrapping (bales) on the Vercors plateau, (II) for the production of Beaufort cheese with local variations (collective alpine summer pastures in the Tarentaise region, individual alpine pastures in the Tarentaise or Maurienne regions), (III) with a small individual alpine pasture area at fairly low altitudes in the Chablais region, (IV) “grass + maize” system + production of cereals for sale in the Trièves region (Felten, 2009). 2 Scenario proposed to farmers in the ClimAdapt project. 7Analysis focused on the forage system, which is directly exposed to climate variations. By “forage system” we mean an information and decision system aimed at balancing resources and forage needs to reach a production objective within a context of given constraints (Duru et al., 1988), integrating the renewal and durability of the forage resource over several years or “a pluri-annual time step” (Fleury et al., 1996). The functioning of the forage system was reconstructed with each farmer during semi-structured interviews to obtain information about the changes in practices following drought periods, thereby identifying the measures implemented. Since there was a succession of unusual droughts in the period 2003-2009, the practices and changes adopted at this time are still fresh and clear in the mind of stock farmers. It was thus this period that we referred to during the interviews before addressing the question of measures envisaged for the future, and in particular with respect to a scenario of alternation of dry years and humid years2. 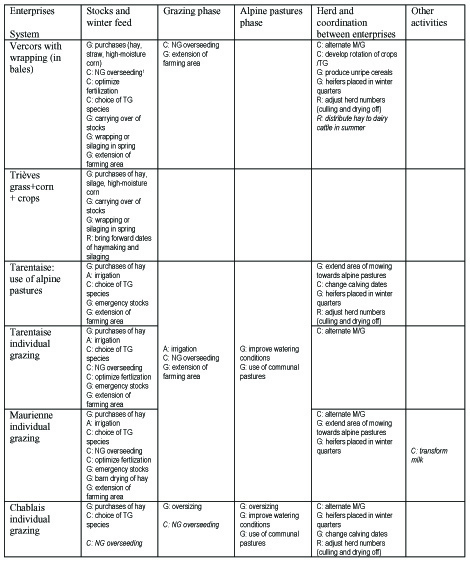 We have classified these measures in different production units or “on-farm enterprises” (Coléno and Duru, 2005): (1) constitution of stocks to provide winter feed for the herd, (2) grazing, with a distinction being made in some cases for (3) an alpine pasture phase, (4) herd management, (5) other crops. The measures introduced may thus concern the management of an on-farm enterprise (sizing, scheduling of tasks, technical aspects) or the coordination between enterprises. 8In some cases, we also considered other activities (goods produced on farm, direct sales, agritourism): even if they are not directly affected by drought conditions, they may have been introduced to lessen the negative impact on farm incomes. - Avoid: act (directly or indirectly) on the cause of the hazard so that it does not arise, for example, by irrigating (compensating for the absence of precipitation) or resorting to soilless culture so as to be independent of the climate. - Cushion: accept the risk but look for ways to attenuate the effects. For example, spreading out the lambing periods over time and diversifying plant resources make it possible to lessen the effects of a seasonal drought. Diversifying activities also helps attenuate the effect of a drought on income by developing activities that are less dependent on climate or by developing products with greater added value. - Get round: act neither on the causes nor the effects, but seek ways of getting round the risk. For example, oversize the pasture area in relation to herd needs or purchase hay to compensate for a decrease in stocks harvested. - React: React rapidly to the effects of a disturbance when it occurs. For example, divide the herd into smaller groups in order to be more ready to benefit from a diversity of small grazing areas, or complement animal feed during a short period if there is not enough grass. 10These “attitudes”, described by Girard (1995), are revealed by the type of measures mobilised or, in other words, by the technical choices of the stock farmers. 11In terms of the resilience and adaptability of social-ecological systems, the approach proposed by Walker et al. (2004) provides useful insights for analysing how the implementation of measures changes the sensitivity of the forage system to climate hazards. Resilience is the capacity of a system to absorb disturbance and to reorganise itself in such a way as to maintain a certain number of characteristics. In our case, drought is the disturbance and the more resilient a forage system is, the less sensitive to drought it will be. A system’s resilience may be described according to different criteria (figure 2) and in particular: latitude (the extent of change that a system can undergo before reaching a threshold or point of no return), resistance (ability of system to withstand change), precariousness (proximity of the state of a system to a point of no return). For Andrieu (2004), a forage system where each year the practices are reorganised so that the level of production can be maintained, is not sensitive: in other words, it is very resilient and its resilience, according to Walker et al. (2004), can be explained by considerable latitude. Nor is a system sensitive when it is able to maintain its results each year without having to modify its practices, and its resilience comes from its great resistance. If maintaining results makes the system more fragile (for example, farm income decreases or the environment or resource becomes degraded), then the precariousness of the system increases and may call into question its resilience, resulting in a system breakdown (cessation of activity or substantial transformation of the farming system). Figure 2. Different aspects of a system’s resilience (from Walker et al., 2004). L - latitude; R - resistance; P - precariousness. 12We are not in a position to estimate the level of resilience of the forage system, but instead we evaluate the way in which it changes according to the measures implemented: a measure which increases the latitude of the system will enable practices to be changed in function of the disturbance – implementation of this measure can therefore be changed from one year to another – whereas a measure aimed at making the system more resistant will be non-reversible (this is often reflected in a change in system structure). Some measures may have consequences on the precariousness of the farming systems. 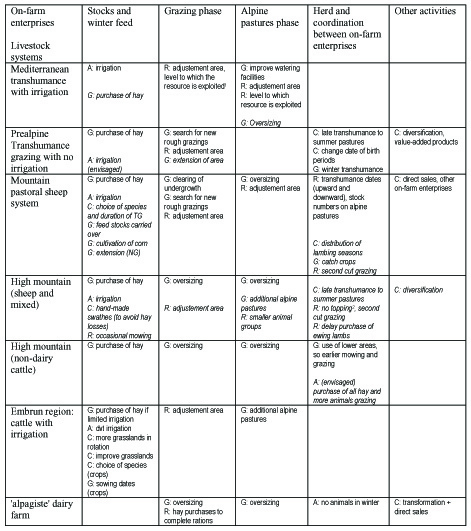 13For each of the 13 livestock systems studied, we classified the measures used by livestock farmers for each on-farm enterprises and identified the corresponding attitudes (tables 1 and 2). 14To secure animal feedstocks and provide winter feed, the most common solution, whatever the system, is to get round the problem by purchasing hay, a quasi-systematic practice in dry years. Another solution is to avoid having to face the problem by resorting to irrigation, which ensures sufficient yields. This measure, however, is implemented by a minority. Those farmers who practise transhumance, whether they use irrigation at lower altitudes or not, are less vulnerable since their winter season is short and grazing remains possible, whether this be on new growth in meadows that were earlier mown for hay, as in Crau, or in French Mediterranean rough grazinglands. The other systems implement additional measures: getting round the problem by extending the area (which provides a larger surface area to build up hay stocks, but is a solution that appears limited given that the areas on which machinery can be used are already used and in considerable demand) and cushioning the risk by choosing plant species that are less sensitive to drought. 15In terms of resilience, the solutions of irrigation and extending the hay meadows are aimed at strengthening system resistance. The latitude of the system is improved by purchasing hay, on condition that purchases remain limited and are reversible (reserved for the driest years). Indeed, purchases could lead to a worsening of the financial situation and make the system more precarious. They must therefore be reserved for exceptional years and used in conjunction with other measures. For example, in 'mountain pastoral' systems, some farmers benefit from certain latitude in managing food stocks thanks to supplies being carried over from more clement previous years. The 'high mountain' systems are perhaps the most precarious: the winter is very long (at least six months) and often their only solution is to buy fodder (irrigation is impossible or marginal, there are very few additional areas that can be used for mechanised farming, and any improvement of grasslands is technically difficult). Finding winter quarters for the animals, the solution of the high mountain dairy farmer3, is thus a radical solution of avoidance in dealing with the problem of feedstock (heightened resistance), but it has a cost: the system will only be resilient if the farming system can sustain these winter costs in the long term. 16To secure inter-season grazing phase and alpine pastures, livestock farmers have no solution that avoids disturbance. They combine two complementary attitudes: (1) getting round the problems caused by drought by “oversizing” the grazing areas in relation to normal herd needs (structural oversizing, extending area, scrub clearing); (2) the ability to react quickly when required by resorting to the use of adjustement areas in dry periods (woodlands or crop aftermath grazing, etc.) by closer grazing, by dividing up the herd into smaller groups capable of better exploiting the alpine pastures and the rough grazings, and by the duration of the grazing period on alpine pastures. Table 1. Attitudes and main measures implemented (or envisaged) by type of livestock system in the French Southern Alps. dvt: development; NG: natural grassland; TG: temporary grassland. 17Oversizing is aimed at making the forage system more resistant, while other measures allowing farmers to adapt to conditions as they occur during the year give livestock farmers and shepherds a margin for manoeuvre with which to improve the system’s latitude. High mountain livestock farmers focus mainly on the resistance of their forage systems (structural oversizing of grazing areas), while the pastoral systems make use of the latitude (by modifying each year the use of a wide variety of grazing areas). 18Other technical adjustments, such as changing the dates of lambing periods with a view to bringing herd needs more into line with forage availability, are aimed at increasing the resistance of the forage system by acting on the coordination between on-farm enterprises. When they can be adapted to conditions as they occur during the year, the dates of the changeover from one enterprise to another, or the allocation of areas to different enterprises improve the latitude of the system. It may be observed that transhumant systems with irrigation do not adapt through coordinating the different on-farm enterprises. These enterprises concern very different areas, often located at considerable distances from one another, so that movement between them is not easy and cannot be easily changed: having been subjected to drought for a considerable time, they manage the sensitivity of each enterprise separately. This is undoubtedly a severe constraint for these systems which otherwise appear fairly resilient, resorting sometimes to the system’s resistance (irrigation) and other times its latitude (adjustement areas, level to which resource is exploited). 19Finally, the diversification of activities may help make income more secure and thus attenuate the consequences of drought. Although diversification can help make the farming systems more resistant, it is difficult to reverse from one year to the next since it generally involves investments. In our sample, this diversification of activities is more often implemented in the Pre-alpine and mountain pastoral systems rather than in the high mountain systems or in the Mediterranean transhumance systems with irrigation. 20For the dairy-cattle farming systems in the Northern Alps, even if the methodology used in the ClimAdapt project was more concerned with strategic adaptations at the pluri-annual level rather than adjustments to conditions arising during the year, the analysis grid reveals that attitudes of “reaction” are quite rare (apart from adjustments on the dates of culling and drying off of animals or the distribution of hay in the summer). This concurs with earlier studies that underlined the inter-annual rigidity of dairy systems with advanced planning of land use (Camacho et al., 2008). 21For feed stocks, farmers always get round: firstly, by short-term buying of fodder, as in the Southern Alps, but also by using stocks from previous years, by enlarging areas so as to obtain sufficient fodder resources to survive the winter, or even by renting winter quarters for the heifers. Cushioning is often associated with this solution (choices of varieties more resistant to drought for temporary grasslands, optimised fertilisation). Livestock systems studied in the Vercors and the Trièves region do not have alpine pastures to reduce summer pressures (on fodder resources), but they are not subjected to AOC (with a guarantee of origin) rules as in Savoie: to ensure there are sufficient stocks, getting round the problem by recourse to fermented fodder (grass silage or wrapping, maize silage or immature crops silage) is a solution that they have used for a long time, which allows early mowing in the spring and additional harvests in the autumn. In the Maurienne and Tarentaise regions, where AOC specifications prohibit the use of silage and wrapping, avoidance through irrigation seems to be the preferred route. For livestock farmers in the Tarentaise region, who use alpine pastures for their animals, and those in the Maurienne, a solution to get round is also opted for by mowing the lower parts of the alpine meadows to balance the pressures on farmlands (which are particularly affected by drought) and on the pastures (which appear less affected). Table 2. Attitudes and measures adopted (envisaged) by type of dairy livestock system in the French Northern Alps. Alternate M/G: alternating mowing and grazing (prevention of vole infestations); NG: natural grassland; TG: temporary grassland. 22As we have seen for the Southern Alps, the purchase of fodder in drought years provides forage systems with a certain latitude, but it can raise problems of precariousness if droughts reoccur, particularly in the AOC areas, where forage self-sufficiency is more and more required, in order to affirm that products are truly local in origin. As for other measures implemented or envisaged as a complement to the purchase of hay, they either increase system resistance (structural expansion, irrigation, systems where heifers are wintered on other farms) or provide the system with greater latitude (early silage, wrapping in late autumn, mowing of alpine pastures). 23For grazing, adaptations are often based on a 'get round' attitude by expanding the area under pasture. Unlike certain systems in the Southern Alps, structural oversizing is rarely mentioned by stock farmers, though it seems to be frequent at least for heifer herds (Camacho et al., 2008). In alpine pasture areas, greater use of communal pastures (sometimes forsaken in favour of private areas) and the watering of animals (reservoirs, catchments) are the two ways to get round. These structural changes strengthen the resistance of the forage system. Inter-annual rigidity in the use of land, however, represents a shortcoming of these systems. 24In both the Northern and Southern Alps, the main problem relating to drought lies in the constitution of feed stocks for the winter, except for those farms where irrigation is a possibility. Pastoral livestock farms with a short wintering period appear less sensitive, even if the constitution of standing herbage that can be used for winter pastures is also highly dependent on climatic conditions during the year. But elsewhere it is indeed the need for stocks of hay for the winter period, capable of lasting up to 6 months, that is the Achilles’ heel of these forage systems. In the surveys we conducted, we observed a desire to get round this problem with structural changes based on the relocation of small groups of animals: winter transhumance on the Mediterranean firebreaks, cattle wintered on lowland farms, livestock farmers in Savoie that leave farmers in the Hautes-Alpes department to breed their dairy heifers, who then resell them three years later ready for calving (savings on feed stocks and grazing, economising on space in farm buildings and simplification of work for the livestock farmers in Savoie). 25The transhumant systems with irrigation, which have always had to deal with droughts, have hardly introduced any new measures, except in the alpine pastures. As for the other pastoral systems (Prealpine and mountain), they are already used to getting round climatic hazards by integrating adjustement pasture areas (emergency areas) into their grazing calendar. These areas are integrated into the very logic underlying these livestock systems and can be used in difficult years, as and when required, namely during the inter-season periods, by mobilising the potential offered by the sylvo-pastoral environment according to the physiological needs of the different groups of animals (Bellon et al., 1999). Apart from these measures aimed at making the most of their latitude, these systems have carried out a certain number of structural modifications and are preparing others to adapt to this new climate context. Compared with the pastoral systems in the south, the dairy cattle systems of the Northern Alps and the high mountain systems have only a few solutions for improving their latitude and are focusing on oversizing to make them more resistant. 26In general, the “avoidance” solution is not often used and the most common attitude is to get round, with different measures adopted depending on the on-farm enterprise (recourse to outside resources for feed stocks, expansion and oversizing for grazing). But it would be difficult to define an overall and uniform attitude for each system since “get round” is often associated with other attitudes (“cushion”', reactions to conditions experienced during the year). The same is true of the changes in resilience because of the combination of measures that give the system more latitude and others which improve the system’s resistance. Although similarities in attitudes exist between systems, analysis of the results also revealed differences and enabled us to identify discrepancies between livestock systems with regard to changes in their resilience. 27To take into account the results of the on-farm surveys, we decided to study on-farm enterprise, without going as far as a detailed analysis of the “practices- seasons” (Bellon et al., 1999), but which made it possible to study the links between the spatial and temporal organisation of the farm. The study of the coordination between on-farm enterprises and the scale of the farming system enabled the identification of measures that are sometimes concealed (changes in the dates of lambing or calving to avoid the periods when resources are lacking, processing of agricultural produces to compensate for lower production). 28The translation of measures into attitudes should be understood in terms of the objectives of the livestock farmers. For example, for the livestock farmers in the survey, the main objective of the improvement to watering facilities was to better explore certain mountain grazing areas: in this respect it is a solution to get round, aimed at increasing available resources. This same measure could have been considered as avoidance if it had been targeted at solving problems of springs drying up, as was the case sometimes in 2009 for certain alpine pastures. 29Qualifying the type of attitude adopted in response to risks based on the study of technical practices does not prejudge behaviour in the face of risk. Periods of drought represent a risk that has become heightened in recent years and bears witness to increasing climate variability, which in turn has been linked to climate change. But the risk represented by climate change will also be reflected in other phenomena (rising temperatures, for example) that will upset the ecosystems. Moreover, it is undoubtedly abusive to speak of the drought. Surveys have revealed that impact of droughts has been different depending on the year (in terms of intensity of drought and the season when it occurs) and on the geographic area. It would no doubt be wise to refine the analysis according to the types of drought experienced. 30Reasoning in terms of resilience provides a framework for studying the way in which a livestock farmer deals with disturbance. Actions affecting the latitude and resistance of the system correspond to different types of adaptation that will lead to different ways of managing the forage system. However, we have not been able to quantitatively assess the impact of these measures on resilience, nor to determine their effectiveness in the medium term. For example, the oversizing of grazing areas, though providing a more resistant forage system, exposes the system to undergrazing and to scrub invasion (Camacho et al., 2008). On the other hand, too much close grazing can lead to degradation of pasture resources from repeated overgrazing. These two risks combine to increase system precariousness. Taking a wider view of the problem, some authors define resilience as “the capacity of a system to endure” (Dedieu and Ingrand, 2010), that is taking into account the capacity of farmers to adapt (Darnhoffer et al., 2010). Such a perspective would be interesting for our study. 31Even if our study is based on a limited sample, and even if intra-system individual variations exist, the results confirm a differentiation in the methods of adaptation according to livestock system. The surveys tended to focus on the methods of adaptation to certain negative effects of climate warming, but the farmers also mentioned positive effects that facilitate adaptation to droughts, such as the decrease in the length of the winter period. Shorter winters reduce animal feed stock needs and allow an earlier start for plant growth or the acceleration of the phenology, which may allow a more intensive exploitation of resources when the drought is not too severe (examples: one or two additional grass cuts and the possibility of mowing at higher altitudes). An improvement in the quality of the fodder harvested has also been observed. 32Walker et al. (2004) speak of system transformation when the system, faced with a situation that no longer appears tenable, undergoes modification to reach a new state of equilibrium. We have not observed such transformations but only adjustments to the existing system, because farmers have placed themselves in a context of alternating dry and normal years, with the possibility of catching up between years. However, in the ClimAdapt project, a second scenario of a succession of dry years was also put to farmers. Firstly, the farmers found it difficult to imagine themselves faced with such a scenario, and transformations – sometimes radical – in the livestock systems were then mentioned (changeover from milk to meat, or even stopping farming activities altogether). In the Southern Alps, such transformations were envisaged by those farms in the most precarious situations (those with least fodder autonomy for winter feeding): in high mountain regions, some farmers envisaged stopping mowing, using all the meadows on the farm for grazing with a bigger herd in summer and then buying all the hay needed for a reduced herd in winter. The transhumant farming systems without irrigation facilities seem to focus more on securing winter grazing in the Midi region of France to eliminate any need for winter feed stocks. 33In addition, improvements to system resilience (oversizing, adjustement areas) may also be in contradiction with rules associated with farm subsidies (imposing, for example, a minimum animal stocking rate). 34Our analysis has focused on the farming operations. Several measures implemented concern territorial resources (water, land), the study of which needs to be conducted at the scale of the local area from a joint management perspective, involving multiple actors and multiple uses. This is the objective, for example, of the ClimAdapt project for 2010 (Sérès, 2010). Other measures involve coordination at fairly extensive territorial scales and examine the strategies concerning certain aspects of the AOC cheese production and processing systems such as the breeding of heifers out of the AOC areas or the purchase of hay. 35Finally, although most studies on the integration of climate risks in the management of agricultural operations have addressed this question in terms of adaptation, it seems important not to forget, on the one hand, that these risks are only one element of the context in which farmers take their decisions and, on the other, that the internal dynamics in livestock operations must also be taken into account: what is at stake is also the way in which livestock farmers regard change and how they act in situations of uncertainty (Lémery et al., 2005). Acknowledgments: This study was conducted within the framework of the SECALP4 project supported by the Ministry responsible for the Environment under the programme Gestion et Impacts du Changement Climatique or GICC-2 (Management and Impacts of Climate Change). Thanks are due to the farmers and shepherds who kindly agreed to participate in the survey. Part of the information on which this article is based came from work conducted by the Pastor'@lpes network, coordinated by the SUACI Alpes du Nord, bringing together pastoral farming services of the Rhône-Alpes region. Thanks are also extended to Claire Sérès, in charge of the ClimAdapt project at Suaci Alpes du Nord - GIS Alpes-Jura, to Pénélope Lamarque (Laboratoire d'Ecologie Alpine) and Cécile Boissin, éric Deboeuf, Benoît Felten, Laure Le Courtois (students who contributed with different studies on the impact of drought in the Alps). This research was partly conducted on the long term research site Zone Atelier Alpes, a member of the ILTER-Europe network. ZAA publication n° 4. 1 This project examines the margins for manoeuvre available to mountain agriculture in dealing with climate change. In addressing this question, it identifies a number of objectives: to characterise the homogeneous morpho-climatic zones in the Alps and the Jura massif, to construct adaptation strategies by production system, to test the acceptance of farmers, and to jointly manage territorial resources (water resources, land resources). 3 This “alpagiste” system (dairy cows are wintered in other farms) is not often found in the Southern Alps but is more common in the Northern Alps, particularly in the Tarentaise region. 4 Adaptation of alpine territories to the renewed outbreak of droughts in a context of global change.